Supplemental post: A car manufacturer is actually applying an “achievement unlocked” system to encourage car maintenance. You might or might not believe what happens next, depending on a combination of your personality traits! | WorstPlans.com updates every Monday! Supplemental post: A car manufacturer is actually applying an “achievement unlocked” system to encourage car maintenance. You might or might not believe what happens next, depending on a combination of your personality traits! As previously discussed on this very site, “gamification” is a hot topic in the world of behavioral influence. The car manufacturer Qoros (观致汽车) (Wikipedia link) is attempting to use this technique in the automotive world. 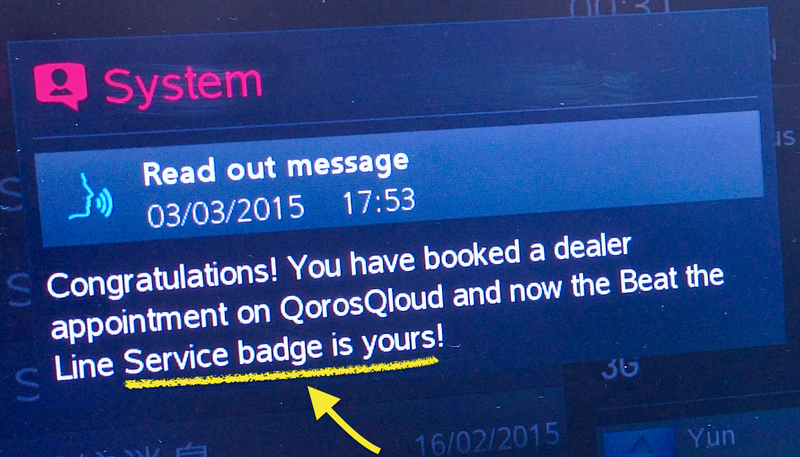 The picture below (from the electronic dashboard of a 2015 Qoros sedan) displays the “Beat the Line” achievement. Achievement unlocked—you made an appointment to buy a car! Or possibly took your car in for scheduled maintenance! Or at least did something at a dealership! Unfortunately, a full list of available achievements / badges does not appear to be available. In fact, I can find no mention of this incentive system anywhere on the Internet! Hopefully this concept catches on and results in many additional creatively-named car maintenance and/or purchase achievements.